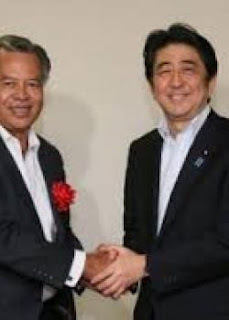 Pacific Islands Forum Leaders including Cook Islands Prime Minister Puna will meet with Japan’s Prime Minister Shinzo Abe this week in the margins of the 8th Pacific Islands Leaders Meeting (PALM) in Fukushima. The 3-yearly meeting of PALM sets the framework for Japan’s co-operation with the Pacific Islands Forum (PIF) for the next three years and is an invaluable opportunity for PIF Leaders to discuss a range of issues with Japan as a collective and bilaterally, at the highest level . Issues to be discussed by PIF Leaders with Prime Minister Abe include Japan’s new strategic development initiative titled the “Free and Open Indo-Pacific Strategy” and PIF priorities as articulated in the 2017 Forum Communique. The “Blue Pacific” identity endorsed by PIF Leaders at their meeting in Samoa last year calls for inspired leadership and was recognized by Leaders as the core driver of collective action for advancing the Leaders vision under the Framework for Pacific Regionalism. During PALM8 this week, delegations will have the opportunity to meet bilaterally with PM Abe as well as with Japan’s heads of cooperation of businesses to discuss trade and investment opportunities and possible cooperation including in tourism, agriculture, fisheries and people to people relations. Since the establishment of diplomatic relations with Japan in 2011, the Cook Islands has strengthened co-operation with Japan in a range of areas. Japan has provided funding support to various community level projects including the Tei Muri Motia Volunteer Fire Rescue Station which services Vaka Takitumu, Te Kainga O Pa Taunga Mental Health and renovations to the Apii Te Uki Ou primary school. Japan has also seen a 64% increase in visitor arrivals to the Cook Islands. The two Governments are also increasingly collaborating in the multilateral fora on matters of mutual interest including the International Maritime Organisation, UNESCO and the WHO. There is however scope for further mutually beneficial co-operation and the Cook Islands will be looking to advance this at next week’s meeting. Prime Minister Henry Puna who is also Foreign Minister will lead the Cook Islands delegation, supported Foreign Secretary, Tepaeru Herrmann. All costs for the delegation’s attendance of PALM 8 are covered by the Government of Japan.